Oshkosh Daily Northwestern, Wednesday, December 11, 1901. Frank Amos, of the Holllster-Amos Company Suffers Stroke of Apoplexy at His Home Late Tuesday Afternoon. Frank Amos, one of the most prominent business men of this city and a co-partner in the Holllster-Amos company died suddenly at his home, 703 Algoma street, at four o'clock Tuesday afternoon. The news of the sudden death was soon noised about the city and expressions of regret and sympathy for the stricken family were heard on every side very shortly after the sad occurrence. While Mr. Amos had not been feeling well for the past two or three months, it was not suspected that death was near, and his sudden calling to the great beyond has come like a shock upon his family and friends. Mr. Amos was not what would be called a rugged man as to his health but with the exception of occasional attacks of rheumatism he was in good health until the last two or three months. During that time he had complained more or less of trouble with his head and at various times had spoken of retiring from active work. On Tuesday, afternoon he was at the office of the Hollister-Amos company and at about 3:30 o'clock he started to drive down town and had gone about as far as the First ward, school when he commenced to feel ill. He returned to the office and told Col. S.W. Hollister, his partner, that he was feeling badly, and at his suggestion Mr. Hollister got into the rig and drove Mr. Amos home. On the, way Mr. Amos complained of feeling worse and of having a pain in his head. Upon arriving at the house Mr. Hollister offered to assist Mr. Amos into the house but the latter protested that he could go in alone. Although he seemed weak and made progress but slowly he succeeded in getting into the house unaided and sat down in a chair while Mr. Hollister started to notify Mrs. Amos who was at the Algoma street M. E. church where she had gone to attend to some preliminary work for the church fair. Mr. Amos asked the housemaid for his wife and Almost immediately afteward, and before Mrs. Amos could arrive home, expired. Dr. C.W. Oviatt was summoned and he pronounced the death due to appoplexy. Frank Amos was born in London, England, May 2. 1840, and came with his parents to this country in 1848 where they settled in Racine. Mr. Amos lived there for a number of years going from there to Burlington, Wis. where he engaged in the business of farming. On Nov. 27, 1862, he was married to Miss Caroline L. Loomis, of Burlington, a cousin of Col.S.W. Hollister. In 1866, Mr. and Mrs. Amos came to Oshkosh to live and he entered the business of wood selling and occasionally in the winter time went into the woods as a logging contractor. In 1882 Mr. Amos, with the late John Stanhilber and Col. S.W. 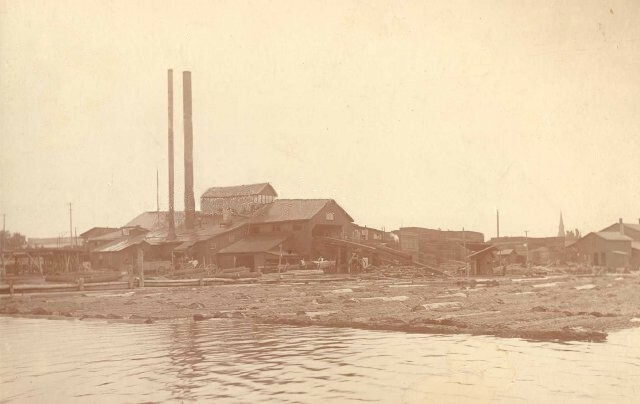 Hollister bought out the lumber and saw mill business of Mead & Ripley and the business was conducted under the firm name of the Stanhilber-Amos company. In 1893, Messers Hollister and Amos purchased the interests of Mr. Stanhilber and the co-partnership under the name of the Hollisterr-Amos company was formed and continued up to this time. By a strange coincidence Mr. Amos' partner, Mr. Stanhilber also died of apoplexy about a year after retiring from business. During the past several months his health being poor, Mr. Amos had determined to retire from business and several months ago had purchased from the company, of which he was a member, the large stock farm near Fond Du Lac. During the past summer a number of improvements have been made on the place and new bulldings erected and it had been arranged that after January first, Mr. Holllster was to purchase the interest of Mr. Amos in the lumbering business, and Mr. Amos would remove to his farm where he would spend the remainder of his life in the comforts earned by years of hard labor. Besides his wife, Mr. Amos is survived by one daughter, Mrs. George Morris, of Fort Atkinson, and one brother in this country, Arthur Amos, who lives at Kimball, Neb. Mrs. Morris arrived today to attend the funeral of her father. Mr. Morris has but recently purchased an interest in the re-organised McMillen company's factory and business and his family was about to remove to this city to make their home. The deceased was a man of sterling integrity, upright and respected. He was idustrious and had succeeded in accumulating a comfortable fortune, but did not forget the less fortunate. However, any giving was done in a quiet way, characteristic of the man. He was modest and and retiring and was not a member of any secret societies. The funeral arrangements have not been made at this writing. Burlington Standard Press Thursday, June 23, 1966, p. 6. Miss Ida M. Bushnell, 90, R.3, died Wednesday, June 15, at the Burlington Nursing Home. She was born Sept.5 1875, in Burlington to William and Sarah Toombs Bushnell. She spent all her life in Burlington and never married. She pursued the occupation of housekeeper and was a member of Plymouth Congregational church. Mrs. Bushnell was a graduate of the University of Wisconsin and was a member of the 50-year alumni club. She taught Latin on a regular and a substitute basis. She donated a large tract of land between the old and new cemeteries at Brown's Lake. Funeral services will be held today, Thursday, June 23, at 2 p.m. from Plymouth Congregational chapel, with the Rev. Trent Rockwell officiating. Interment will be in Burlington cemetery. Miss Bushnell will be in state from 1 p.m. until time for services at the chapel. Arrangements were handled by the McCarthy-Rueter funeral home. Surviving are cousins and friends. DAVID BUSHNELL. farmer, Sec. 33; P. O. Burlington; he was born on the shores of Oneida Lake, Madison Co., N. Y., June 17, 1814; lived there and assisted his father on the farm till 1836, and then came to Wisconsin; stopped a very short time at Pike Creek, then wandered across the country prospecting till he arrived at the lower forks of Fox River; he located within one mile of village of Burlington; engaged at farming built a wigwam, in which he lived for a few years; Mr. Bushnell is the earliest settler living in the neighborhood in the early times they had to undergo many hardships and privations; in 1837, the Settlers' Claim Society was organized; its object, to protect their claims from the claim-jumpers; in those days, a man settled and lived on a lot thirty days, had to cut so many rails, or plow so furrows, to entitle him to his claim; the industrious men often had trouble with claim-jumpers and loafers; on one occasion, in 1837, the society found it necessary to engage in a skirmish with the interlopers; it took place near where the village of Burlington is now situated; it is known as the battle of Burlington, fought by upwards of one dozen men; no one was seriously wounded; Norman Dyer was shot in a limb by William Curtis, who was firing in the dark, and aimed at Silas Peck, whose claim Curtis had tried to jump, but failing in his attempt, and aggravated by his failure, tried to kill Silas Peck. After the shooting, Curtis fled to parts unknown but was finally captured in Illinois, and tried in Springfield. His trial was postponed, he gave straw bail, escaped, and has never - been heard of since. Mr. Bushnell married in Burlington, Jan. 7, 1846, Miss Elizabeth Thompson; she was born in Madison Co., N. Y., March 26, 1828; had three children- only one now living - William K. Bushnell, born July 26, 1848; he is assisting his father on the farm. William Bushnell married Oct 20, 1870, Miss Adelaide Toombs, a native of Burlington Township; they have one daughter- Ida; they are living with his father, Mr. David Bushnell. He has never aspired to any political offices; he owns eighty-one acres within one mile of Burlington village; the farm is well improved, with spacious barns and a comfortable house. Racine Journal Times, Racine, Wisconsin, Wednesday, December 2, 1936, p. 14. One of Burlington's oldest residents, Mrs. William Bushnell, 85, died Monday night at her home just outside the city limits on Highway 43. Virtually all her life was spent on the farm where she died Oct. 20 of this year, she and and Mr. Bushnell marked the sixty-sixth anniversary of their wedding, and during those 66 years the farm on the old "Kenosha and Burlington road" had been her home. Mrs. Bushnell, whose maiden name was Sarah Adelaide Toombs, was born Feb. 15, 1851, at Racine, the daughter of Mr. and Mrs. Samuel Toombs. When she was a small girl her father went to California, lured there by the discovery of gold, and her mother returned to the old home in New York state. When Mrs. Bushnell was eight years old, her father returned from California, and the family was united again, living on a farm about two miles from Burlington, and near the Bushnell farm. Mr. and Mrs. Bushnell were married Oct 20, 1870, at Oshkosh, Wis. She saw Burlington grow from a small frontier town to the present city, and witnessed the sweeping changes in modes of living which came with the last 50 years. Surviving are her husband, William Bushnell, one daughter, Miss Ida Bushnell, who resided at home, and two brothers, Jerome Toombs, Orson. Ia., and Albert Toombs, Pompey's Pillar, Mont. Funeral services will be held Thursday at 2 p.m. at the Bushnell home on Highway 43. Rev. Carl Stackman, pastor of Plymouth Congregational church, will officiate and burial will be in the Burlington cemetery at Brown's lake. Oshkosh Daily Northwestern, Thurs, June 12, 1890, p. 1. News has been received in this city [Oshkosh, Wisconisn] of the death of Asa Hollister, which occurred at Shawno last night. The deceased was seventy-three years old and leaves a wife and four sons, one of whom is S.W. Hoilister of this city. Shawno County Advocate, Thursday, June 19, 1890, p. 1. Asa A. Hollister of Oshkosh died last week of liver complaint at the age of 72 years while on a visit to his son, W. W. Hollister of this city. His remains were taken to his home for burial. Oshkosh Daily Northwestern, Saturday, April 10, 1909, p. 14. The funeral services of the late Guy W. Hollister, a brother of P.W. Hollister, and Col. S.W. Hollister of this city, will be held Monday afternoon at two o'clock, at the home of P.W. Hollister, 12 Elm street. The Rev. Mr. Stair officiating. The remains will arrive tomoroww morning from Hot Springs, Ark., to which place Mr. Hollister went three weeks ago in the hope of improving his health. His home was at Stetsonville, Wis., and he was afflicted with heart trouble. Internment will be at Riverside cemetery. Lottie Irene Loomis was born November 11, 1866 in Burlington, WI, the daughter of Charles William and Hannah Brittain Loomis. Lottie had removed to Oshkosh in 1889. She married Seymour Hollister, a widower and her 1st cousin once removed (her grandmother and Seymour�s mother were sisters), on Nov. 24, 1897 at Burlington, Racine County. Seymour and Lottie had one daughter, Edith Loomis Hollister. Lottie died in Oshkosh, WI on Aug. 20, 1935. She was survived by her daughter Edith, two stepsons, Carl W. and R. A. Hollister, and three grandchildren. Oshkosh Daily Northwestern, Saturday, March 30, 1907, p. 1. Pioneer Resident Passes Away This afternoon at Three o'clock, After Extended Illness. Mrs. Sarah Hollister of 571 High street passed away this afternoon at three o'clock after an extended illness. She would have been eighty years of age the 21st of next August. Deceased was the mother of Col. Seymour W. Hollister and P. W. Hollister of this city and G. W. Holister of Medford, Wis.
Sarah M. Toombs was born circa 1827 at England. Her family settled in Racine County, Wisconsin. Sarah M. Toombs was married there on Nov. 20, 1842 to Asa Hollister. They came to Oshkosh, Winnebago County in May 1846, where Asa was engaged in the lumber business. They were listed in the 1860 federal census as residing in the fifth ward of the city of Oshkosh. They had a family of five children: William W.; Seymour W.; Philip W., resided at Oshkosh; Guy W., resided at Medford, Wisconsin; and Anna Hollister. Sarah died in Oshkosh on Mar. 30, 1907. Seymour W. Hollister was born in 1845 at Burlington, Racine County, Wisconsin. He was a son of Asa A. and Sarah M. (Toombs) Hollister. Asa was born on Oct. 10, 1817 at Wayne County, New York. At age thirteen he removed with his parents to Chautauqua County, New York and they remained there until 1833. They then removed to Adrian, Michigan and stayed at that place for seven years. In 1840 the family removed to Racine County, Wisconsin. Asa was married there on Nov. 20, 1842 to Sarah M. Toombs. She was born circa 1827 at England. They came to Oshkosh, Winnebago County in May 1846, where Asa was engaged in the lumber business. They were listed in the 1860 federal census as residing in the fifth ward of the city of Oshkosh. They had a family of five children: William W.; Seymour W.; Philip W., resided at Oshkosh; Guy W., resided at Medford, Wisconsin; and Anna Hollister. Asa died at Shawano, Shawano County on June 11, 1890. He was returned to Oshkosh for burial in Riverside Cemetery. Sarah died in Oshkosh on Mar. 30, 1907. Seymour resided at Oshkosh and enlisted there on Aug. 12, 1864. He was assigned to Company B, 3rd (reorganized) Regimant, Wis. Cav. on Feb. 1, 1865. He was mustered out on June 19, 1865. After the war, Seymour resided at Deerfield, Chickasaw County, Iowa. On Sept. 15, 1876 he was attacked and robbed. His house and contents were burned. He also resided for a time at Chicago, Illinois. He was listed in the 1885 census (21st Regt., N.Y. Vol. Inf.) at P.O. Oshkosh. He was listed in 1888 as a member of GAR Post #10 at Oshkosh. In a biography of his father from 1889, Seymour was then in Canada and engaged in the lumber business. The lumber mill with which he was connected was located at Garden River, Ontario, Canada. In 1882 Frank Amos he went into partnership with Seymour Hollister and John Stanhilber and purchased the Mead & Ripley Lumber Company and changed the name to Stanhilber-Amos Company. In 1893 the company became Hollister & Amos Lumber. Outdoor view taken 1902-1903 of the Hollister & Amos Lumber Company. The mill was located on the north east side of the Fox River at the foot of Blackhawk Street. The river is in the foreground with logs waiting to go into the mill. The mill and other buildings are plainly visible. St. Peter's Catholic Church is visible on the right horizon. Seymour was listed in the 1890 federal census as residing in the city of Oshkosh. Earl, son of Seymour, died of diphtheria at Oshkosh in Dec. 1892 at age 5 years and 7 months. Seymour was listed in the 1895 and 1905 Wisconsin State census at P.O. Oshkosh. He was married in 1868 at Kewaunee, Kewaunee County to Katherine G. Smith. She was born on May 11, 1846. She came to this country when 7 years old. They had a family of five children. Katherine died at their home on Algoma Street in Oshkosh on Nov. 19, 1896. She was survived by Seymour and four children: Asa Raymond Hollister; Winifred S. Hollister, age 17 years, later married William C. Bouck; Carl W. Hollister, age 13 years; and S. Rex Hollister, age 12 years. Katherine was buried in Oshkosh at Riverside Cemetery. Seymour was then married to Lottie Irene Loomis on Nov. 24, 1897 at Burlington, Racine County. She was born at Burlington on Nov. 11, 1866 and was a daughter of Charles W. and Hannah (Brittain) Loomis. Lottie had removed to Oshkosh in 1889. Seymour and Lottie had one daughter, Edith Loomis Hollister. Hannah Loomis, mother of Lottie, died in Oshkosh on July 21, 1926. Seymour was listed in 1905 as president of Oshkosh Trunk Co. and residing at 922 Algoma Street in Oshkosh. Carl and Rex Hollister were then residing with him. Sarah, mother of Seymour, was also listed in that year as residing at 571 High Street in Oshkosh. Seymour died at Oshkosh on Feb. 19, 1916 and Lottie died there on Aug. 20, 1935. She was survived by her daughter Edith, two step-sons, Carl W. and R.A. Hollister, and three grandchildren. Green Bay Gazette, May 26, 1896. Spinal Trouble Causes His Demise After a Long Illness. William W. Hollister died at his residence, 718 Mason Street, at 6:15 this morning, of spinal trouble at the age of 52 years. Mr. Hollister had been ailing for the past year and had been quite sick for several months. Besides his wife, three children, two daughters Annie and Ethel, and one son, Myron, survive him. Mr. Hollister was a member of the G.A.R. and lived in the city for the past four years. The body will be taken to Oshkosh over the Northwestern Road Thursday morning for interment. Previous to remains to the depot short services in which the Waverly quartette will sing appropriate hymns, will be held at the residence. Soldiers' and Citizens' Album of Biographical Record containing personal sketches of Army Men and Citizens Prominent in loyalty to the Union, 1888, p. 559-560. William W. Hollister, a citizen of Shawano, Wis., and a member of G. A. R. Post No. 81, was born November 26, 1844, in Racine County, Wis. He is the son of Asa and Sarah Ann (Toombs) Hollister, both of whom are living at Oshkosh. He paternal grandfather was a soldier in the Mexican war and was a descendant of Major Hollister who was in the British service during the Revolution. Mr. Hollister has three brothers; Phillip W., and Guy reside at Marinette, Wis., and are engaged in the lumber business and in the manufacture of sash, doors and blinds. G. W. Hollister is engaged in lumbering and milling in Canada and was a soldier in the 3rd Wisconsin Cavalry. Mr. Hollister of this sketch grew to manhood in Wisconsin and he enlisted August 30, 1864, in Company E, 2nd Wisconsin Cavalry for one year or during the war, and made connection with the command at Memphis, Tenn., where he was engaged in scouting duty and in all other relations pertaining to cavalry service, in which he was engaged until the regiment was disbanded. In the spring of 1865 he was engaged in protecting Union citizens from rebels and bushwackers and in June of that year was discharged as stated. Among the expeditions in which he took part was the second raid under Grierson in Mississippi. He escaped without serious injury or illness and he acted in the capacity of Orderly Sergeant in which he was engaged in the parole and exchange of rebel soldiers. On his return from the army he came to Oshkosh and engaged in lumbering, which has since formed his business connection and where he has also operated as a contractor. In 1882 he removed to Shawano where he has since been similarly engaged. He has held the office of Town Clerk, as a stanch Republican and is proud to belong to a political organization of such noble record. In youth he received a limited education and belongs to the best class of self-made men and his business has become large and prosperous through his own efforts. He was married to Frederica B. Schooley of Neenah and their three children, Anna E., Ethel and Myron W., have been carefully reared and educated and the elder daughter is a student at Ripon College. Burlington Standard Press, Friday, February 28, 1913. BORN HERE 75 YEARS AGO. PASSED AWAY AT EDWARD STREET HOME MONDAY MORNING. The oldest living resident of Burlington passed away Monday morning in the person of Charles W. Loomis. History tells us that Mr. Loomis was the first white male child born in the Town of Burlington, that important event taking place on May 1, 1838, nearly 75 years ago. Charles W. Loomis was the oldest son of Herman and Elizabeth (Toombs) Loomis, the senior Loomis being one of Burlington's earliest pioneers. He came here with his family from New York state in 1835 and took up government land in section 3 and 4, Town of Burlington, and proceeded to make a home for the family. Four children were born to them, Charles, Catherine L., Charlotte and Mary. But death came to the parents in 1847. Mr. Loomis living only a month after the death of his wife in September. The four children were cared for by relatives. Charles going to Oneida, New York, to make his home with his uncle, A. Loomis. When the young man Charles Loomis returned to Burlington and again made his home on the farm which the father had bought, and here he resided till he moved to the Edward St. home about ten years ago. On Dec. 27, 1865, Mr. Loomis was united in marriage with Miss. Hannah Brittain at Honey Creek, who has been a faithful helpmeet for these many years. One daughter, Miss Lottie Irene Hollister, wife of Col. S.W. Hollister, of Oshkosh, survives him with the mother. Two sisters, Mrs. Wortman of Spring Prairie and Mrs. Earl of Oshkosh also survive him. Mr. Loomis had been in feeble health for several years, and for the past year had suffered greatly from a dropsical and other trouble. His funeral took place Wednesday afternoon, with internment in Burlington cemetery. Rev. G.H. Marsh, of Rockford, conducting the services. Mr. Loomis was a man unusually esteemed. A lifetime spent on the home farm made him friends of his neighbors and all who learned to know him. In the home he was an ideal husband and father. As a citizen he was above reproach. He lived more than the allotted three score of years and ten and his exemplary is a lesson that will rebound to the credit of the follower. Burlington Standard Democrat Friday, July 23, 1926, p. 1. Mrs. Charles Loomis, a former resident of Burlington, passed away Wednesday morning at the home of her daughter, Mrs. S. W. Hollister, in Oahkosh. Funeral services will be held this afternoon (Friday) at 2 o'clock at the home of her sister, Mrs. Otis Vaughn, on Lewis Street. Rev. F. A. Stever will officiate and interment will be in the Burlington cemtery. The body arrived in Burlington Thuraday evening on a Soo line train. A complete obituary will be printed next week. Burlington Standard Press, Friday, July 30, 1926, p. 6. Funeral services were held at the home of Mrs. Otis Vaughn on Lewis street last Friday afternoon for Mrs. Charles Loomis, one of the well known matrons of this vicinity, who died the previous Wednesday, July 21, at the home of her daughter, Mrs. S. W. Hollister, at Oshkosh. Hannah Brittain was born in Lincolnshire, England, July 16, 1843. When a girl she came to America with her parents who settled near Honey Creek. In 1866 she was united in marriage with Mr. Loomis and they settled on a farm south of the city where they lived until twentyfive years ago when they moved to Burlington. Mr. Loomis died in 1913 and for the past few years Mrs. Loomis has spent the winters with her daughter, Mrs. S. W. Hollister, at Oshkosh. One sister, Mrs. Otis Vaughn, and one brother, John Brittain, of Wasco, Calif., besides the daughter survive. Also one grandchild, Miss Edith Hollister Those from away who attended the funeral are: Mr. and Mrs. Ray Hollister, Mr. and Mrs. Carl Hollister, Mr. and Mrs. Wm. Bonck, Mr. and Mrs. J. M. Morris, Miss Ruth Morris, Mrs. Wright Hollister, Mrs. James Edwards, Miss Edith Hollister, Miss Loraine Cheeseman, Oshkosh; Mr. and Mrs. T. A. Clark, Manitowoc; Mr. and Mrs. Geo. Potter, Mr. and Mrs. Clarence Potter and family, Elkhorn; Chas. Loomis, Orlo Loomis, Miss Kittie Loomis, Miss Minnie Loomis, Miss Esther Loomis, Elgin; Mr. and Mrs. Hubbard C. Atkins, Mrs. Frederick Allen, Miss Ina Darbellay, Milwaukee; Mrs. A. Wortman, Mrs. Chas. Valley and family, Delavan. Burlington Free Press, Thursday, February 27,1919, p. 1. Mrs. Samuel Toombs (nee Artemesia Rose) died at the home of her daughter, Mrs. Wm. K. Bushnell, near this city, on Monday morning, February 24, aged nearly 89 years. The deceased was born at Fort Montgomery-on-the-Hudson, New York, May 6, 1830. She was married April 18, 1850, at Yorkville, Wis., to Samuel Toombs, where she was making her home with her brother, Vincent Rose. Mr. Toombs died Nov. 4, 1902. She is survived by one daughter, Mrs. W.K. Bushnell of Burlington; and two sons, Albert Toombs, Pompey's Pillar, Mont., and Jerome Toombs, Orson, Iowa. Also a sister, Mrs. Susan Weyant of Cornwall, New York. The funeral was held from the Bushnell residence on Thursday afternoon at 2 o'clock, Rev. E. L. Benson officiating and internment was had in the town cemetery. Racine Times Call, Wednesday, February 26, 1919, p. 2. Mrs. Samuel Toombs died yesterday morning at the home of her daughter, Mrs. William K. Bushnell south of this city after being confined to her bed for more than a year. Mrs. Toombs was one of Burlington's oldest and most respected citizens and had reached the age of 86 years. She is survived by one daughter, Mrs. W. K. Bushnell, of Burlington, and two sons, Jerome Toombs of Iowa, and Albert Toombs of Pompeys Pillar, Montana. The funeral will be held from the Bushnell home Thursday afternoon at 2 o'clock. Rev. Benson will officiate. Interment will be the Burlington cemetery. Jerome Toombs was born March 6, 1852 at Racine, Wisconsim. The following summer his father left for the gold fields of California. [His mother] took him and his year old sister back to [New] York state to her fathers farm which is now West Point Academy, he having sold it to the government. Jerome lived the first seven years of his life there. the father returned and they settled in Burlington, Wisconsin where he lived until 1878 when he came out to what is now Orson, Iowa. He spent all but one year of his remaining life there, going out to Colorado for that period. He married Mary, the widow of Orson Edmonds in 1905, and she passed on in 1915. He was married to Mollie Stockwell Jones on February 1, 1917. For years he was the market for grain and livestock for the Orson territory until his aging years cased him to give up the business. On the 10th day of September, 1943 he and his wife moved to Missouri Valley to live with his step daughter Mrs. L.E. Mead, that he might have better care. He met his death by falling and fracturing his skull on the evening of October 25, 1943, living only an hour and a half after the accident. He was rushed to the Mercy Hospital in Council Bluffs, but his age, 91 years, 7 months and 19 days and his frail body could not stand the shock. He leaves to mourn his passing his wife Mollie Toombs, four step children, George Edmonds of Orson, Lum Edmonds of Little Sioux, Mrs. L.E. Mead in whose home he was living and Fields Jones of Independance, Missouri. Also one niece, Ida Bushnell of Burlington, Wisconsin. Elder George Maggers, assisted by Elder Frank Hough conducted the services at Missouri Valley, Wednesday afternoon, October 27th and the remains were shipped to his old home in Wisconsin where he was laid to rest by the side of his mother and father, as was his wish and desire. Burligton Standard Democrat, Saturday, Nov 8, 1902, German Edition. On Tuesday another of the pioneer settlers of Burlington passed from the earth. Samuel Toombs died on the old homestead about two miles southeast of the city on that day. Mr. Toombs had been in poor health for some time. Recently he was unfortunate enough to break his arm, and his feebleness was unable to withstand the shock. He suffered greatly until death came to him as a gentle relief. Mr. Toombs was born in Buckinghamshire, England, Feb. 13, 1813. He came to Wisconsin and located in Burlington in 1839 and has since resided here. In 1849 he was united in marriage with Miss Artemeisa Rose in Racine, who. with three children, Mrs. Wm. K. Bushnell and Albert Toombs of this town, and Jerome Toombs of Orson, Iowa, survive him. Mr. Toombs was a man prominent in public affairs of the community for many years. He was a staunch democrat and took an active part in politics in early days. He was well known all through this section and esteemed as a good, upright and honest citizen by all. The funeral of Mr. Toombs took place from his late home at 2 o'clock Thursday afternoon, Rev. Wm. Killburne conducting the services, and the remains were laid to rest in the town cemetery.